Hello all, my name is Vanessa and here we have my 5 year old daughter wearing her idol Michael Jackson’s wardrobe mixed and matched by myself. Nothing in this photo is from his original clothing line, everything was bought separately and was put together by myself. 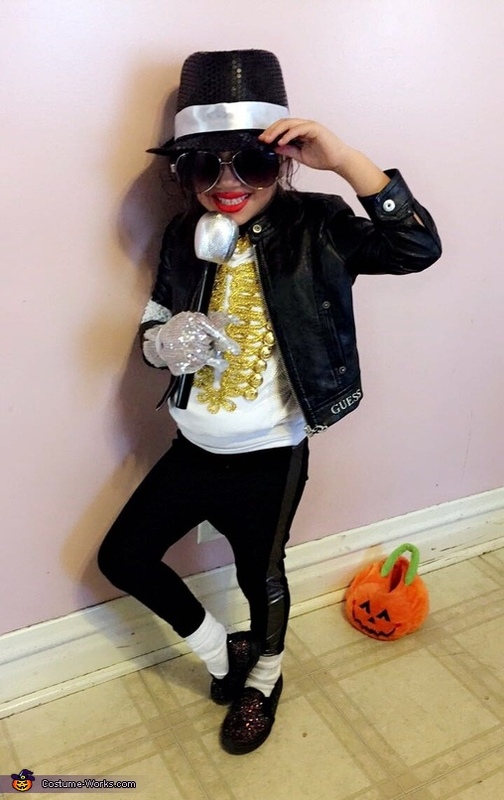 My daughter has an obsession over Michael Jackson’s moves and especially his music so we decided she would dress as him for this Halloween. I carefully studied Michael from the way he did his hair, make up, his sunglasses, his love for fedora hats, the silver glove, the reason behind his white band worn on his right arm, his white long socks, his unique clothing style, his moves, and his poses all to make this costume very unique and fun for my daughter! Her fedora hat was purchased at spirit Halloween store for $9.99 and I added a white ribbon that I had at home. The pants were purchased from Target.com and were $14. Her blouse was purchase at Rainbow shops and is actually a women’s size small, so I had to tuck in most of the blouse and pin it in with safety pins. Her microphone is from eBay and cost $5 along with her silver glove. Her shoes are also from Target.com and were $7.99 on clearance. Her black leather jacket was purchased 5 years ago during my pregnancy at Guess outlet and I do not recall the price (surprisingly this jacket has been worn by my daughter for 5 years now). The black aviator glasses are mine which I purchased at my local Ross for about $10. My daughters hair is naturally curly and long so his hair style was pretty easy to mimic with her. I also added his red lipstick to finalize her Michael Jackson look. My daughter listens to his music and it helps her get inspired every morning into having an energetic day at school. Hope everyone can enjoy it as much as we did and please vote! Thank you.